The Naismith Memorial Basketball Hall of Fame announced its 2019 induction class on Saturday, April 6. The class includes the Wayland Baptist University Flying Queens from 1948-82. The Flying Queens program was at the forefront of women's basketball, offering full athletic scholarships for women in 1950s. The Queens soared to 10 AAU National Championships from 1954-75. The Flying Queens and coach Harley Redin were influential in transforming the women's game to the full-court, 5-on-5 with unlimited dribble style of play. The Queens also won a record 131 consecutive games from 1953-58. "I was speechless when I first learned the Flying Queens had been selected for the Naismith Basketball Hall of Fame," Price said. "There were a few tears of pure joy and gratitude as I thought of all the pleasure that this announcement brings to so many Flying Queens, the Hutcherson family, our coaches - especially my coach Harley Redin - their families and friends." G: Brianna Mueller (5'7''-G) of Lindenwood-Bellev. : Brooke Maeda of Peru St.
: Cali Moscrip of Lewis-Clark St.
: Claire Cudney of Peru St.
F/G: Colyn Springer (5'8''-F/G) of Florida Coll. : Darby Price of MidAmerica Ch. : Dayna Hansen of San Diego Chr. 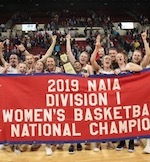 : Elizabeth Hall of Peru St.
C: Hailey Turner (6'1''-C) of Lewis-Clark St.
G: Hannah Miller (5'9''-G) of Shawnee St.
: Jaidan Alley of MidAmerica Ch. G: Jennah Coffman (5'8''-G-96) of MidAmerica Ch. F/C: Jossilyn Blackman (6'0''-F/C) of Lewis-Clark St.
: Kaitlyn McKinney of San Diego Chr. : Krista Buligon of San Diego Chr. : Lauren Beath of Peru St.
: Monica Kinzie of Texas Coll. : Nevada Denton of MidAmerica Ch. 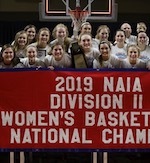 G: Shania Massie (5'7''-G) of Shawnee St.
: Swaranga Fernando of Peru St.
G: Sydney Kremer (5'7''-G) of Lindenwood-Bellev.